WAYNE TOWNSHIP – If enjoy the sights and sounds of twanging and picking banjos, you may want to make your way to this year’s 29th annual Bluegrass Festival on Friday, Aug. 17 and Saturday, Aug. 18 within Ashtabula Antique Engine Club grounds in Wayne Township. (From Aug. 10 edition). According to Chairperson Jim Peska Jr., he has been putting together the bluegrass festival every third weekend in August for almost thirty years now because of his passion for music. Of this year’s features Peska said will include about six different bands playing all weekend between the hours of 6 p.m. until midnight that Friday for a fee of $10 per person, as well as Noon until midnight on Saturday for a fee of $15 a person or $25 a person for the whole weekend. In addition to the live music within the grounds Peska said that visitors will also access to large tents in the event of rain, free camping and firewood Thursday night through Saturday night, a variety of concession stand food, t-shirts, CDS and other band merchandise, Ashtabula County Antique Engine Club museums, general store, gas station, as well old school house, plus a nice Saturday night dinner through engine club members for a set fee. For information about this year’s Bluegrass Festival at AC Antique Engine Club Grounds Friday, Aug. 17 through Saturday, Aug. 18 please call Jim Peska at (330) 442-3377. 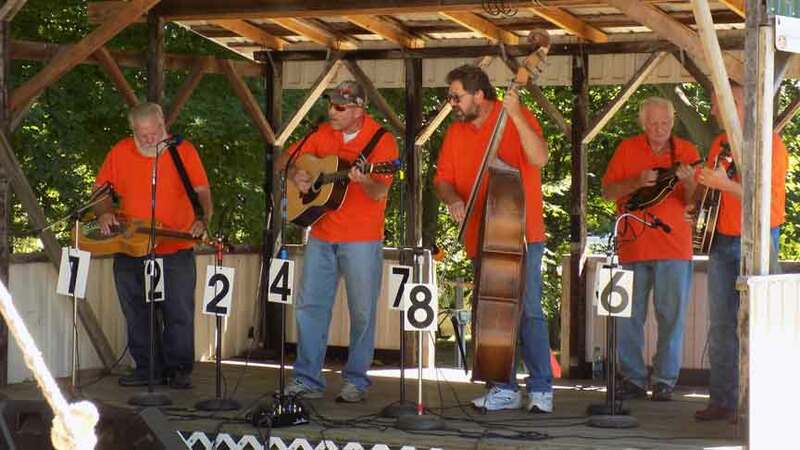 Pictured: All four members of the Red Dust Mountain Boys performing a bluegrass concert within Ashtabula County Antique Engine Grounds in Wayne Township.